ELCO 90049 gear motor Parts diagram for all Slush machines (Not good for Elmeco 1st Class and Big Biz models). 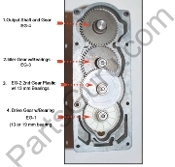 This diagram is free with purchase of any gear motor part. Please note that this gear motor diagram is used in all Elco gear motors used in Faby, Sencotel, GBG, FSM and SPM slush machines.Use the diagram only to identify the components. To order the parts please mention the model of machine in which you will be used. The complete gear motor in different slush machines has different size of drive shaft. Note Faby, SPM and Cofrimell gear motors have 1" drive shaft. GBG, Sencotel, FSM need 1-1/2" drive shaft. Complete gear motors therefore, are not interchangeable. In case of doubt, call us for additional verification. (Do not use this diagram for CAB Faby, Skyline, Elmeco 1st Class and Big Biz models).